Conflict between Orks and the Imperium for control of the Imperial hive world Armageddon. 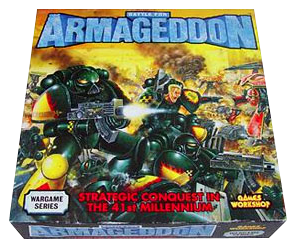 Another in the trilogy of counter wargames produced by Games Workshop in the early nineties, this one enacts an ork invasion of an Imperial planet. A fun game in the old style, before every counter in games had to be a plastic figure! The best place to ask is BoardgameGeek, where you’ll find other players of the game; I’m sure someone will help you out. My copy is in storage at the moment. A little late to the party, but Rick, look me up over at BGG (username Scrat) and shoot me a GM if you are still looking for this. GW made PDFs of the entire game available for free before they turned into an evil, soul-less megacorp :-D. I can point you in the right direction to get those freely available files if you are still looking for them.